This entry was posted in Uncategorized on November 30, 2014 by sophieblovett. 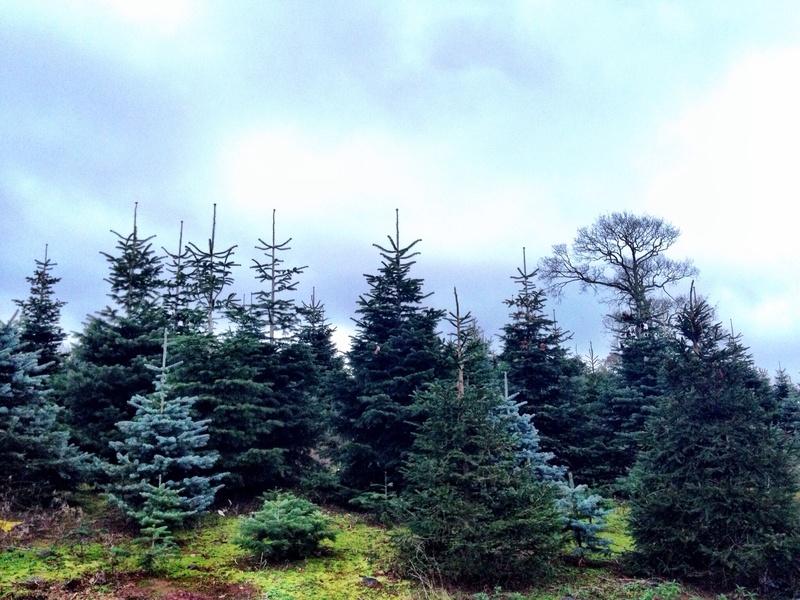 With me and Arthur heading up to London this weekend, we realised we were going to have to get our tree organised early if we were to have any hope of having it up before the middle of December. That might not have been a problem in the past, but what with it being only Arthur’s second ever Christmas, and the first where he’s really beginning to be aware of what’s going on, we are keen to make the most if it. 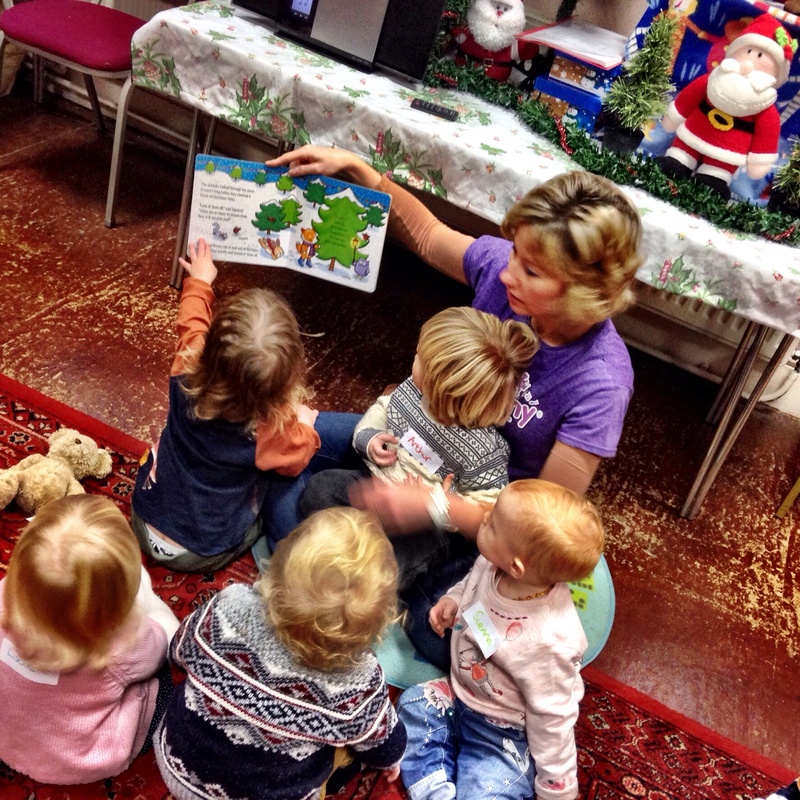 Preparations began on Thursday morning, with a perfectly timed session at Music with Mummy in which Arthur and his friends read a book about choosing the perfect tree (well, Carol read it to them – and of course Arthur was straight in her lap as soon as he got the whiff of a story). 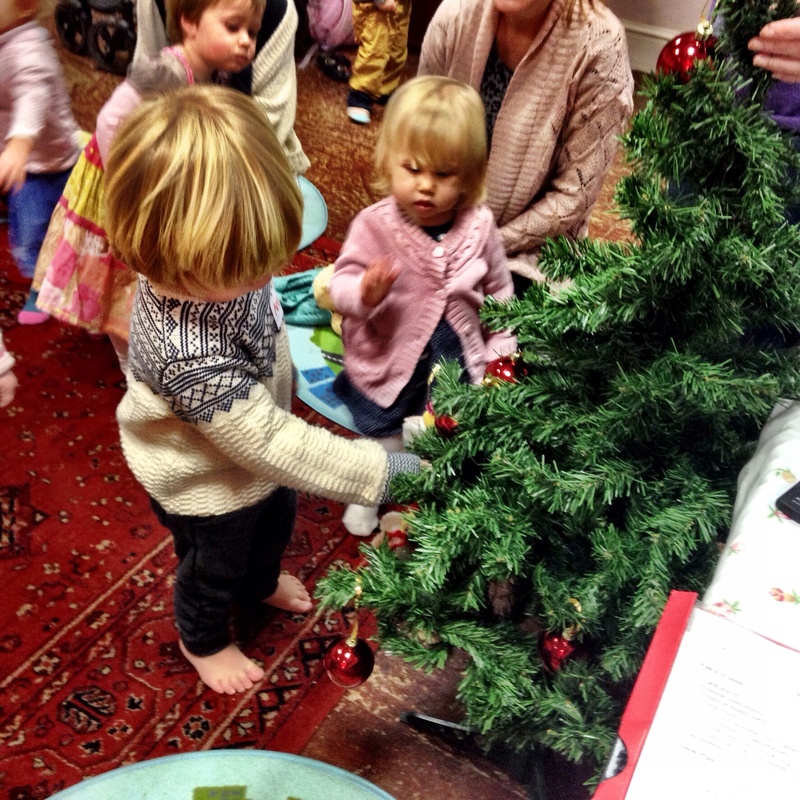 Then we all sang a song about decorating the tree, and there was even a little tree to decorate! 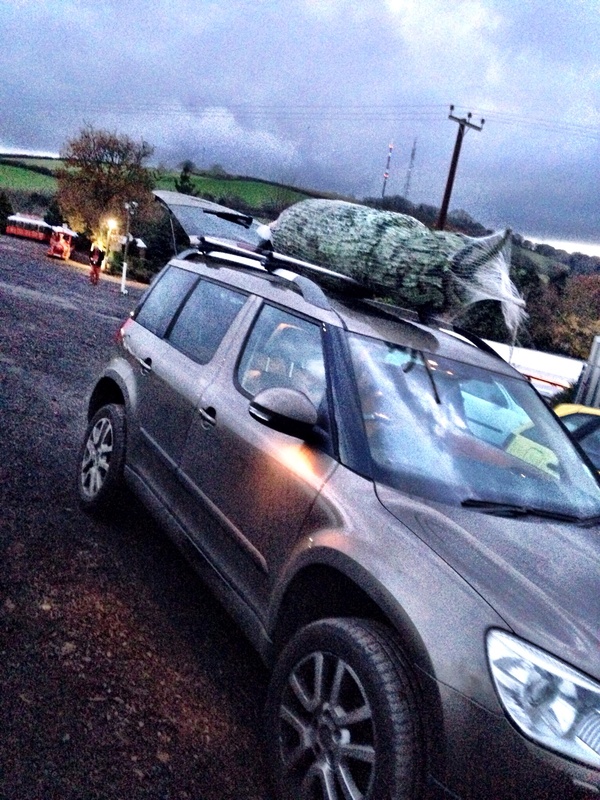 So Arthur knew something of what to expect when, that afternoon, we headed to Marldon Christmas Tree Farm. 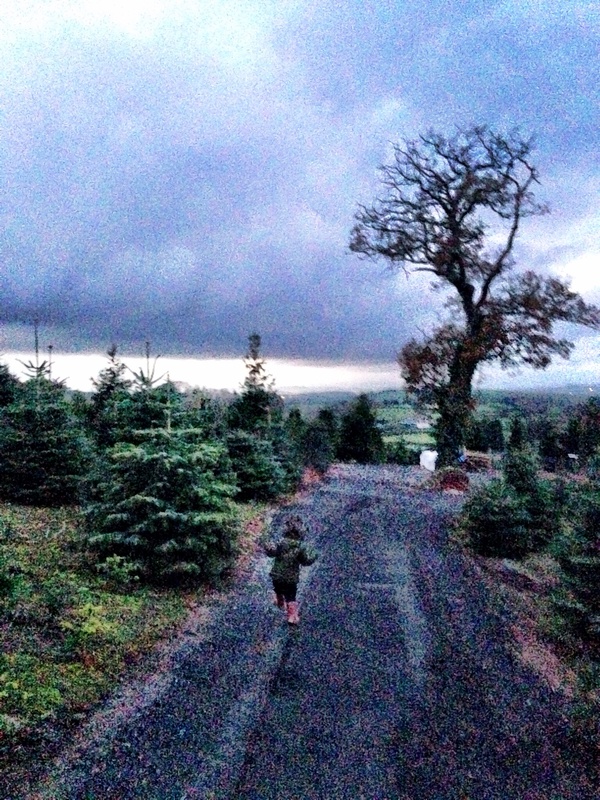 We got our tree from there last year as well, and it really is quite an experience from the moment you turn into the fir-lined drive. They had only just opened for general business that day so not everything was up and running, but the main attractions were very much in place. 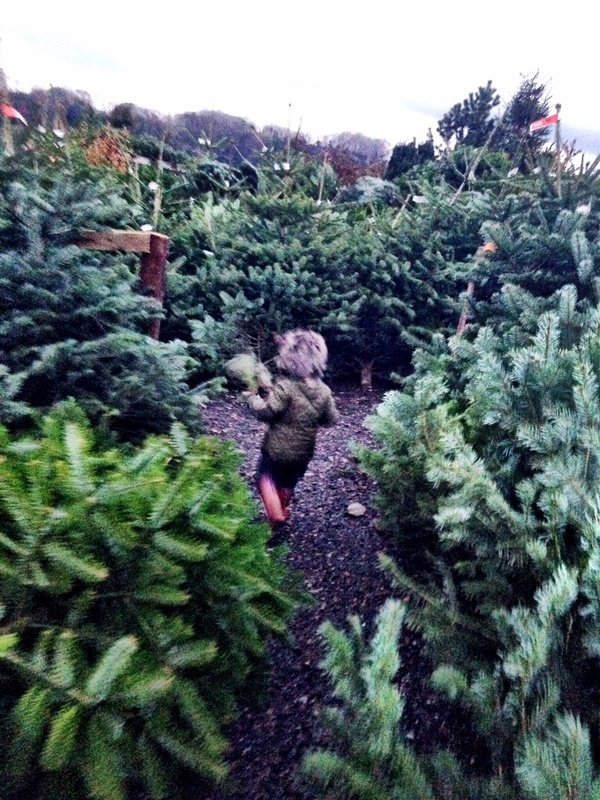 I was all set to spend a while umming and ahhing over the perfect tree, but as soon as we were directed towards the ones that fitted our criteria (6 foot-ish with non-drop needles) Leigh made a beeline for one he said was calling to him. He’s half Canadian, you see. 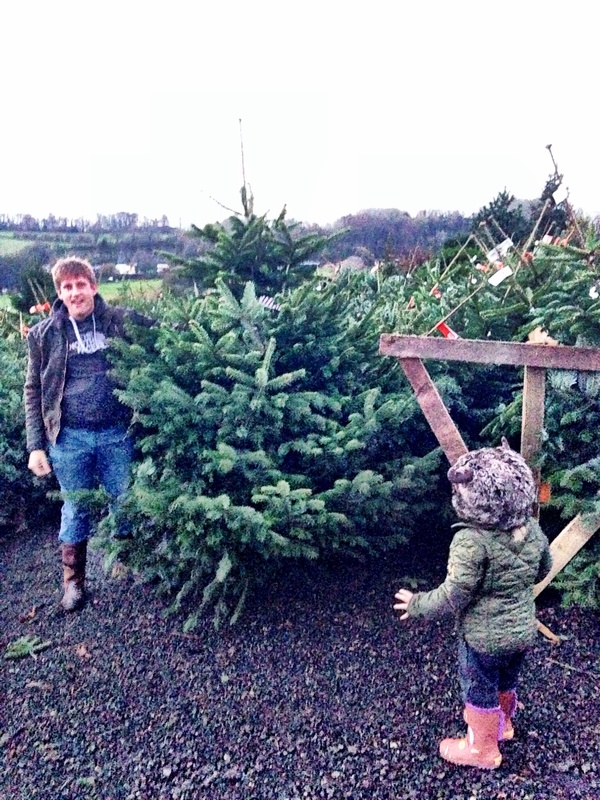 It it was a very beautiful tree, and Arthur seemed to approve. Whilst Leigh was arranging to get it all packed up, we thought we’d better go and have a look at some of the others anyway. 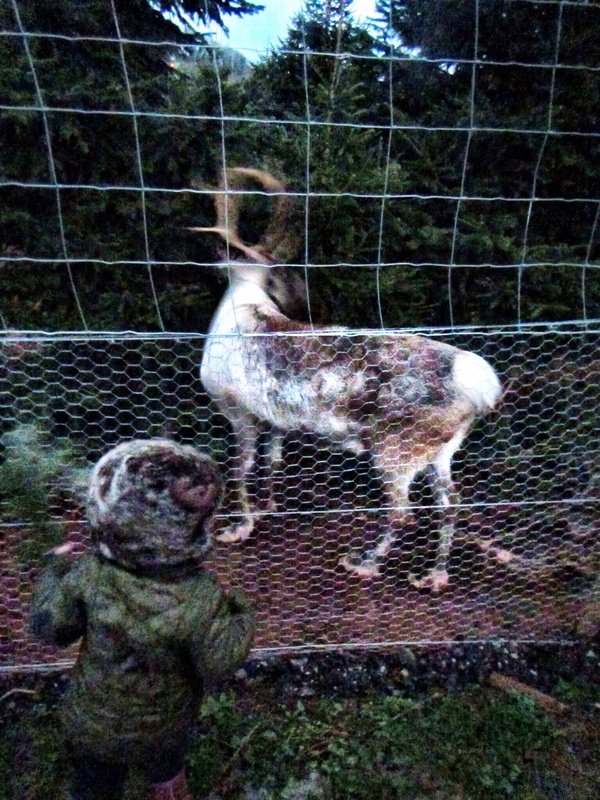 Arthur had great fun weaving between the trees, camouflaged perfectly by his jacket and adding to his disguise by picking up fallen branches along the way. 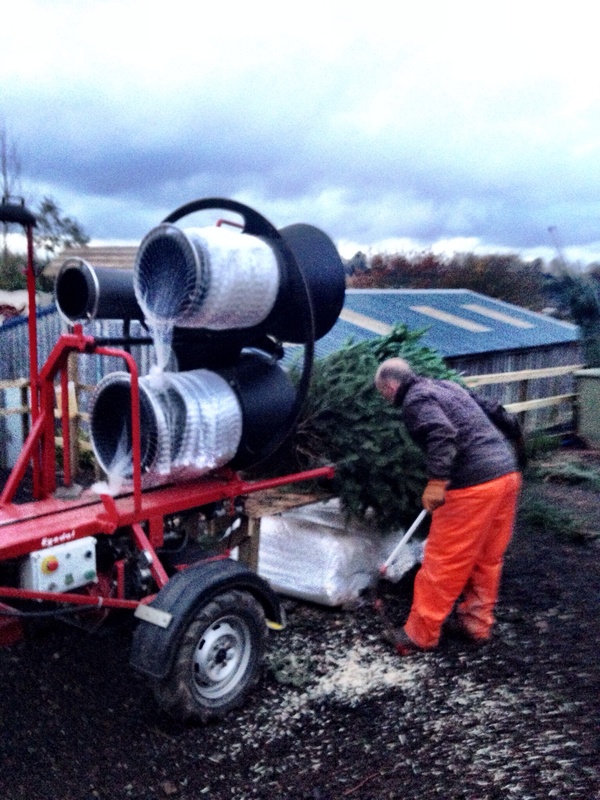 He was fascinated by the whole process of getting the tree ready to transport too – watching as it was trimmed and wrapped and more than a little confused when it was strapped to the top of our car. 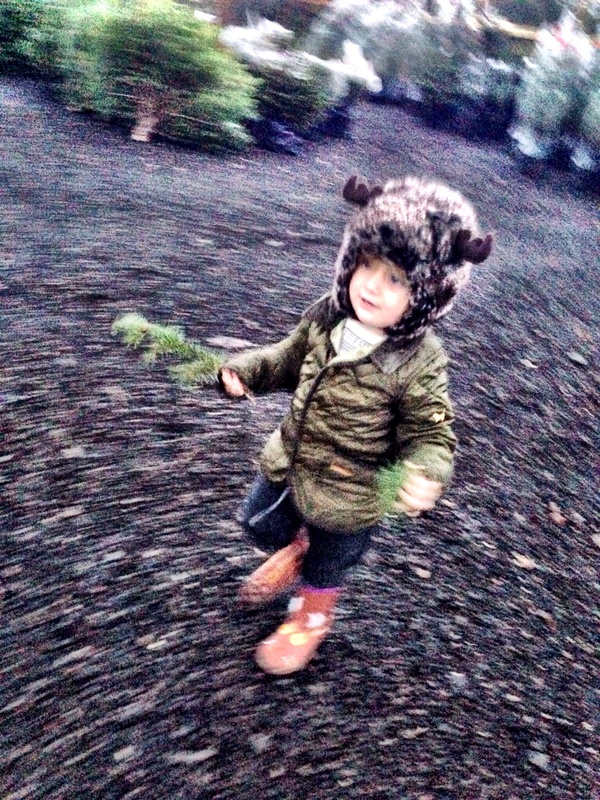 We were just about to head home when I remembered the reindeers. They’d only just arrived from the North Pole, and weren’t strictly ready for visitors, but we were told we could take a little stroll down to say hello if we really wanted to. I didn’t need any persuading! Arthur toddled off between the trees, still clutching his branch and stopping every so often to smell the fragrant leaves that lined his route. 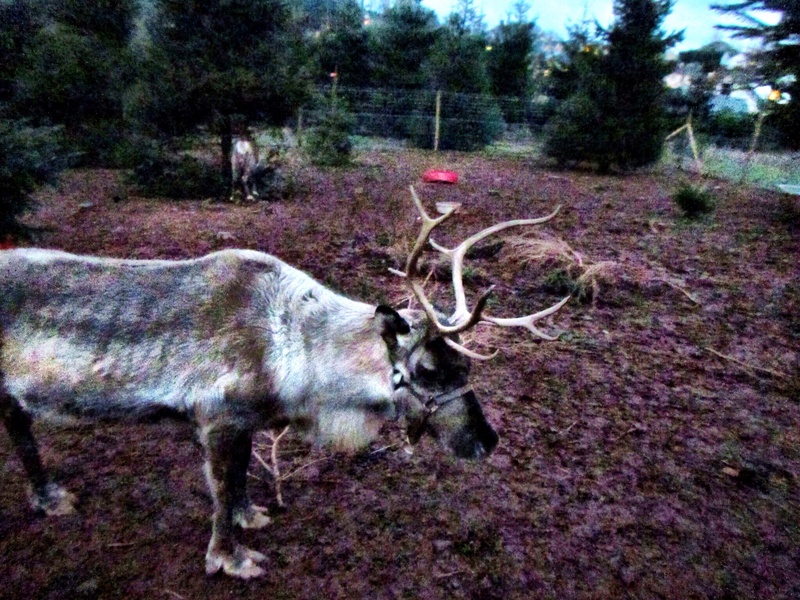 We could hear the reindeer calling in the distance, their voices getting louder and louder. And then we saw them. They are such beautiful animals, and I could have watched them for hours. 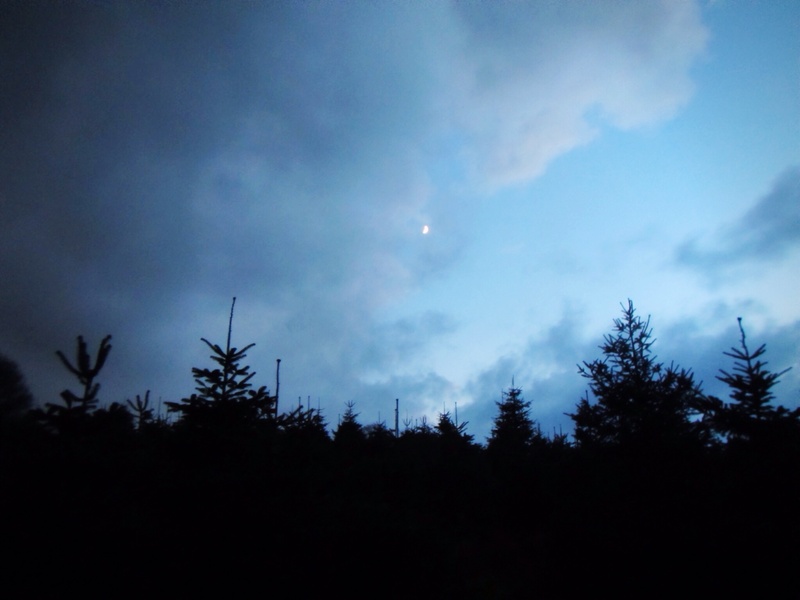 But darkness was rapidly approaching so after a quick chat we headed back towards the car as the moon rose above the trees. 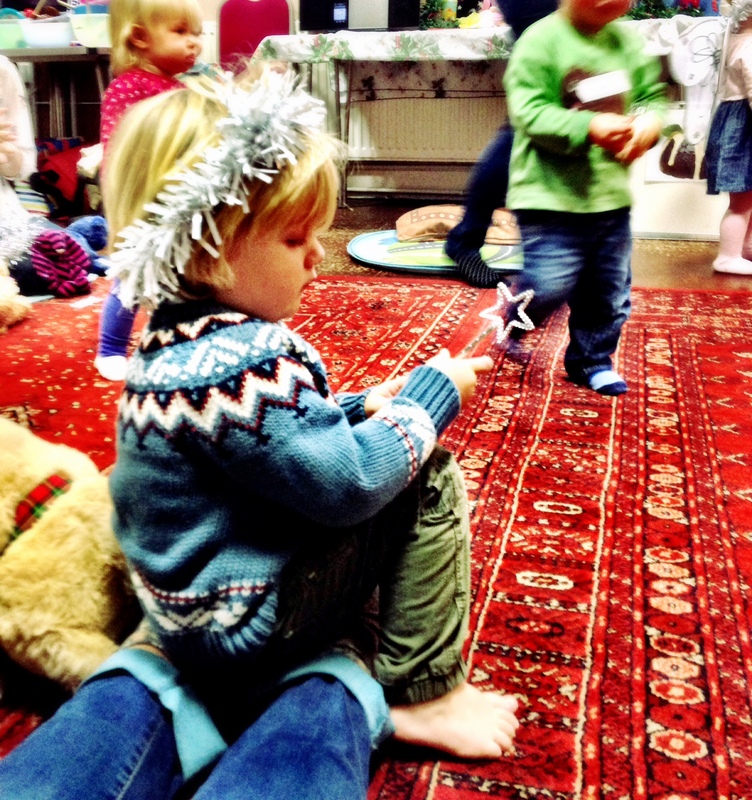 It was a magical little adventure, and the perfect start to the festive season. 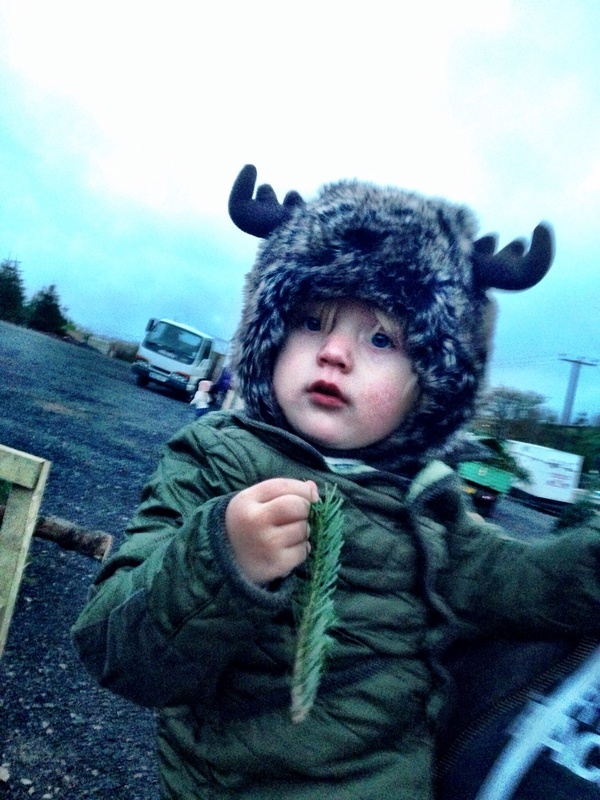 We will definitely go back to the farm over the next few weeks once things are up and running – there’s a German market I’m looking forward to exploring, and we’ll have to let Arthur have a ride on the land train to see how the reindeer are settling in. There was something very special about being there right at the beginning too though, when there weren’t so many people around and it almost felt like we had the place to ourselves. 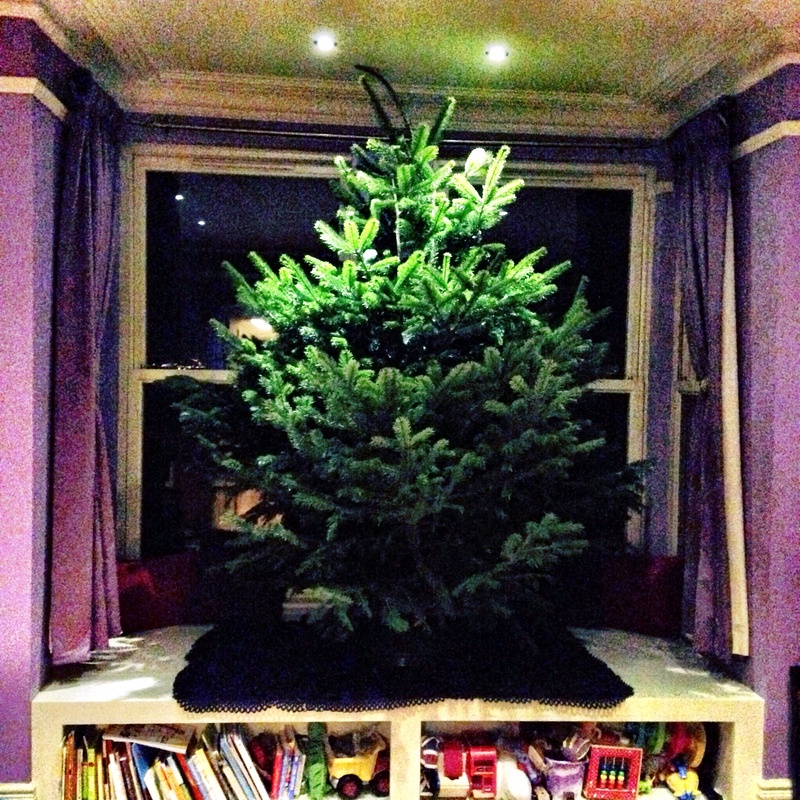 And as for the tree? Well that’s pretty magical too. It looks a little bigger in our lounge than amongst its friends – we might have got just a little carried away… But it’s going to look incredible all lit up and decorated – I can’t wait to dig out all our sparkly supplies when we get home next week! 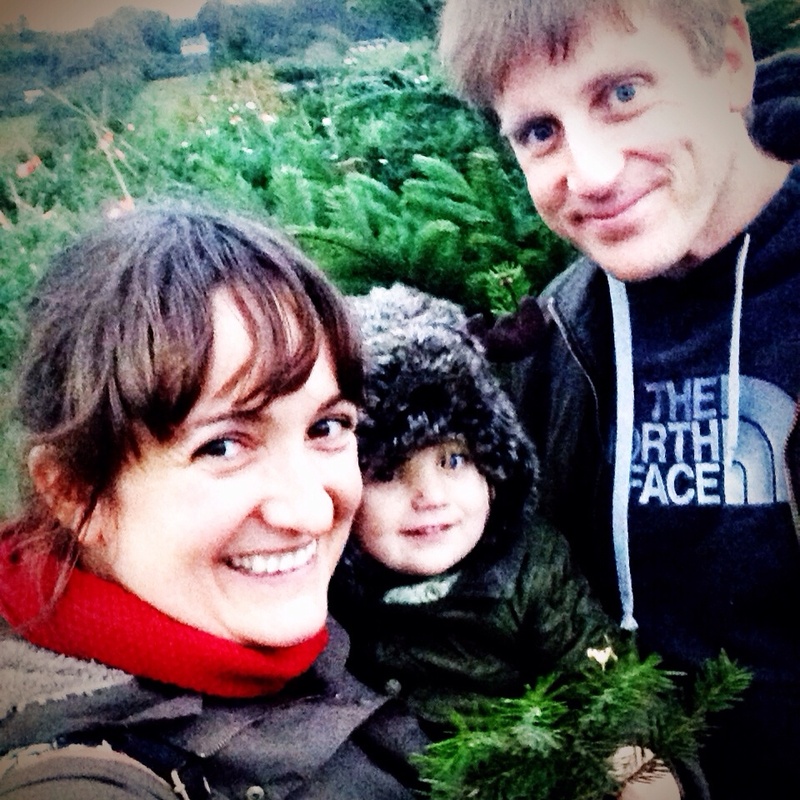 This entry was posted in Sophie is parenting, Sophie loves Brixham, Uncategorized and tagged Christmas, Christmas tree, festive, Marldon Christmas Tree Farm, Music with Mummy, Torbay on November 29, 2014 by sophieblovett. It’s been a bit of a challenging week this week. I’ve still had loads to organise to get to a position where I feel like I’m ready for the craziness of December. On top of that we’ve had lots going on to take us out of the house – what with the rugby in Cardiff last weekend and playdates for Arthur, governors and trustees meetings and chats about possible avenues for researching my next novel, and getting things together for a whistle-stop trip to London this weekend, it’s all been a bit hectic! And then on top of THAT Arthur’s been a bit under the weather – nothing serious (don’t worry mum), but enough that he’s been a bit grumpy and we’ve had three nights now of even more broken sleep than usual. But in between all of that, the over-riding feeling for me this week is that it’s beginning to look an awful lot like Christmas. And I can’t help but begin to get a teensy bit excited. 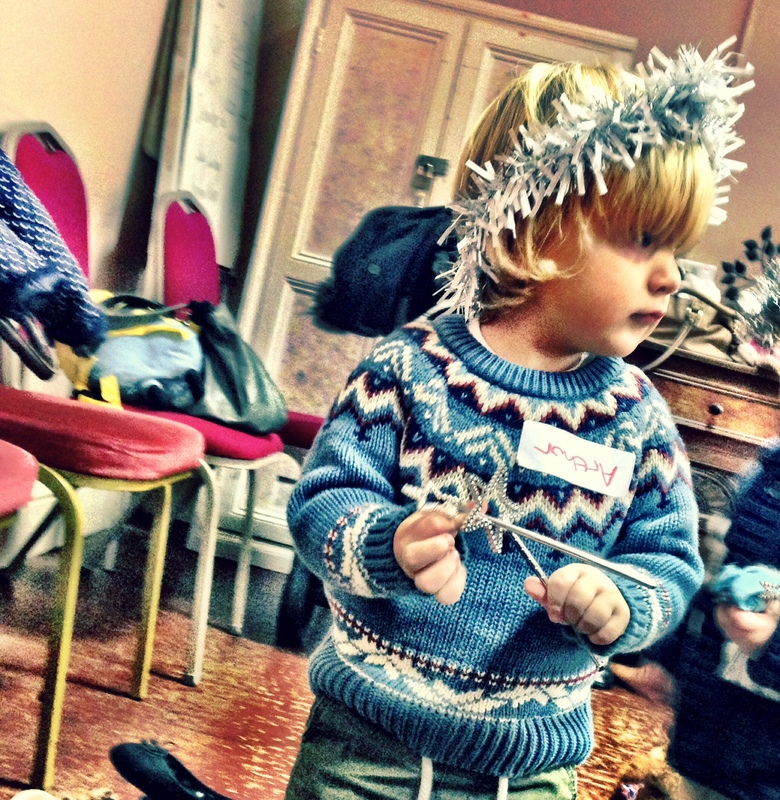 Arthur’s music group has been becoming increasingly festive over the past couple of weeks, with yummy Christmas spices, a serious dose of tinsel and yesterday an introduction to decorating the tree! 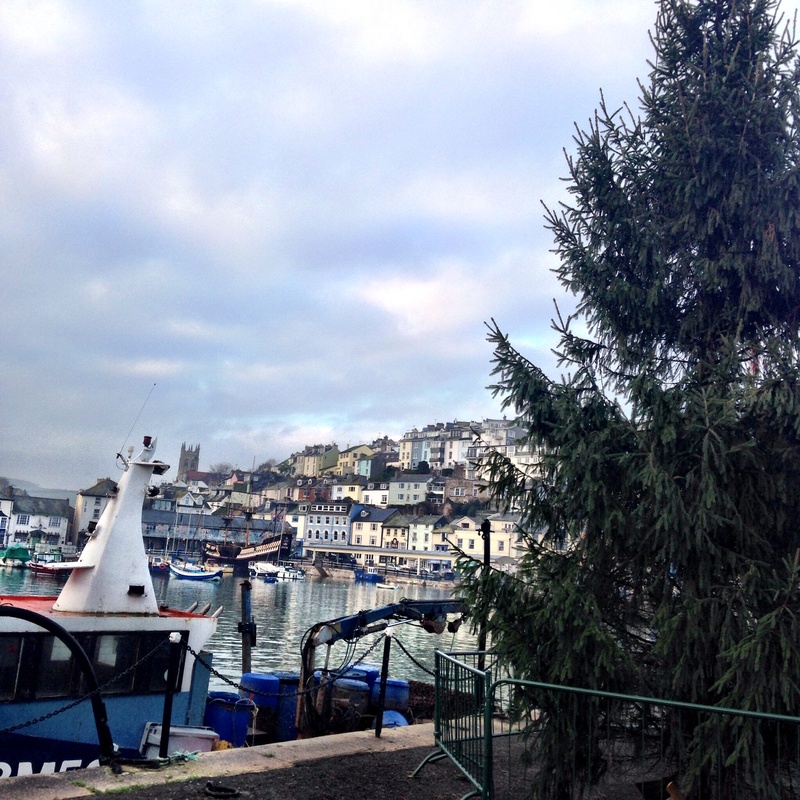 The tree’s up in Brixham harbour too, waiting patiently for the big Christmas illuminations switch on this weekend. I’m a bit gutted we’re going to miss it actually – there’s going to be a lantern parade and fireworks and everything – but my lovely Barcelona friends are over in London for one weekend only. 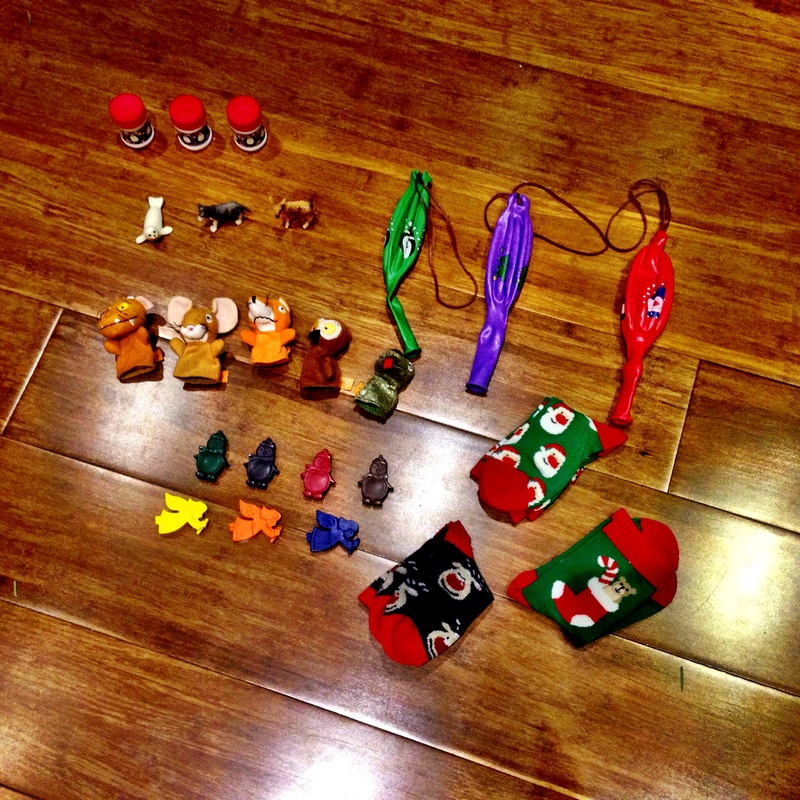 I’ve got Arthur’s advent calendar all sorted too, ready for when we get home on the evening of the 1st of December. I loved putting all the little treats in their pockets (and am happy to say they all fitted!). I can’t wait to see what he makes of it all. 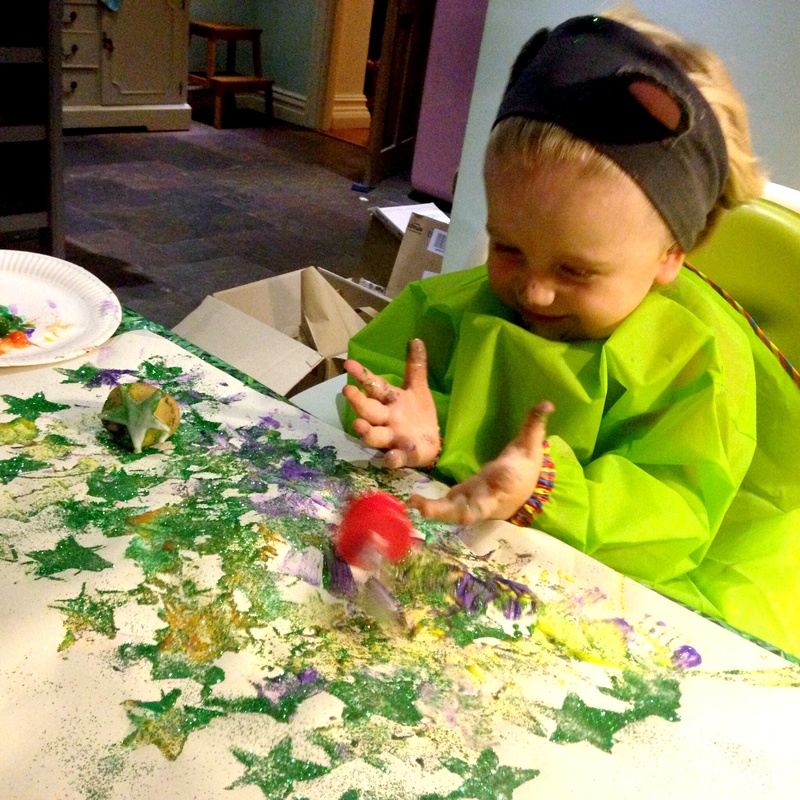 He’s already enjoyed some Christmas crafting – discovering glitter for the first time as we created the artwork for his Christmas cards. 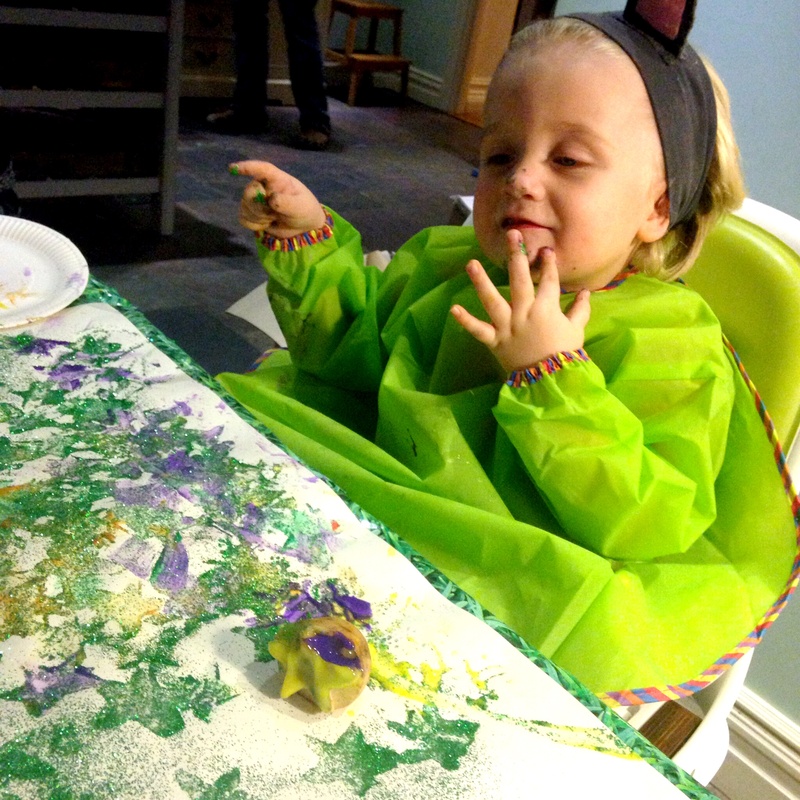 My crafting is underway too, though I can’t give too much away about that without spoiling peoples’ surprises! I will say though that the little project I did yesterday might be my favourite ‘make’ yet, and I’m already looking forward to blogging about it in January. So all in all a pretty festive week, and the start of what I think is going to be a very special festive season now that Arthur is old enough to have a bit more of a sense of what’s going on. I have a feeling his mind might be blown by the sparkle and spectacle of the decorations in London. And on that note I’d better get a move on – we have a train to catch! 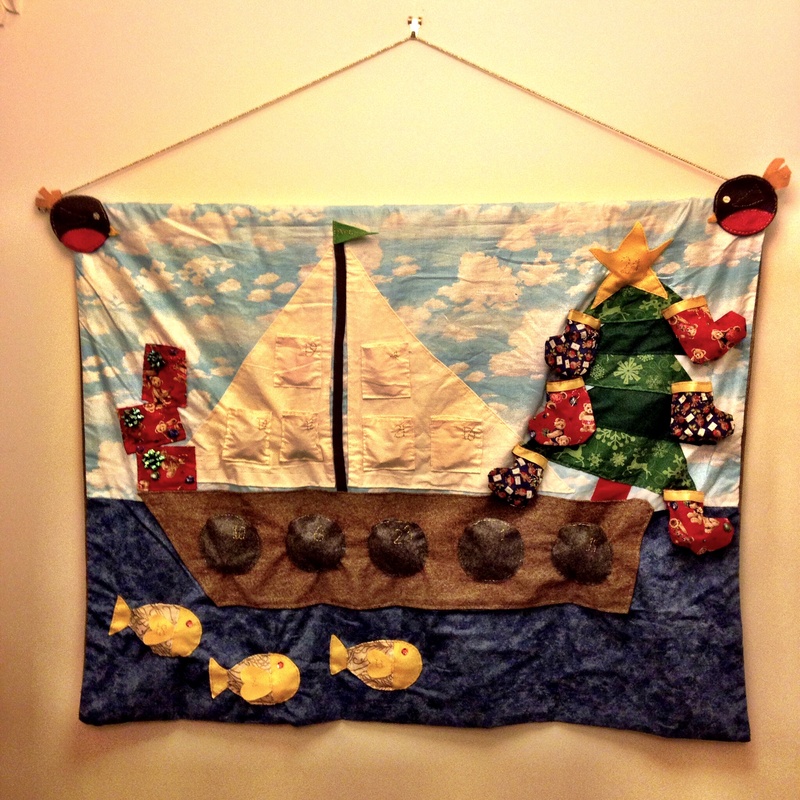 This entry was posted in Sophie is crafting, Sophie is parenting, Sophie loves Brixham, Uncategorized and tagged advent, Advent calendar, Christmas, Christmas spirit, Christmas tree, festive, toddler on November 28, 2014 by sophieblovett. Another character development exercise, this time exploring the relationship my female protagonist had with her mother during her teenage years. She is fifteen when this scene takes place, sometime in the autumn after another long, heady summer staying with her grandparents by the sea. 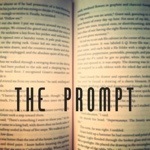 As soon as the words left my mouth I was ashamed, but at the same time a thrill bubbled up deep inside of me. I couldn’t help myself. I willed her to speak but she just stood there, quiet now. She’d goaded me to this, nagging and nagging. And now she wouldn’t even answer me. My heart raced in my chest as my mind churned through all of the most hurtful things it could think of that might provoke a response. Something stopped me though – I still wasn’t brave enough to say them out loud. When she did finally speak her tone was low and measured. I’d heard this so many times. There was a new note in her voice, and with something close to disgust I realised she was almost pleading with me. I wanted to shake her, to force her to understand what I was trying to say. And then, just for a second, I wanted her to hold me, to hear her say that everything was going to be ok. The next time she spoke though it was with the special air of venom she reserved for my aunt. The heat rose in my cheeks as I thought of Joe. Sweet, angry, confused Joe. It was true he’d opened my eyes to what was out there, but I refused to believe for a second that was a bad thing. 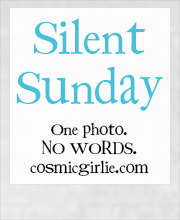 She stood up and smoothed down her apron, forcing me to take a step backwards as she moved into my space. She swept out of the room then, her head held high, leaving me trembling with rage even as the tears began to prick behind my eyes. I never had understood why she hated her sister so much, but in that moment something clicked. Mum was afraid of her. Everything she’d done, all of the decisions she’d made: they were the polar opposite of my parents’ safe, boring existence, the very things that could bring it crashing down. And now my mother was afraid of me, and I had absolutely no idea how that was supposed to make me feel. 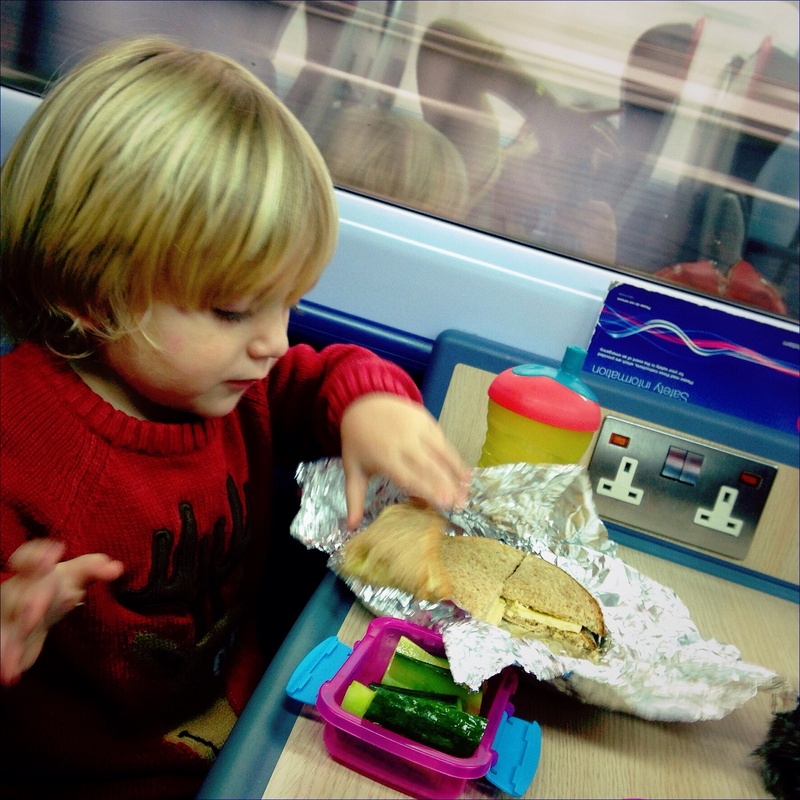 Thank you to Sara at Mum Turned Mom for inspiring this post with her prompt: ‘thankful’. 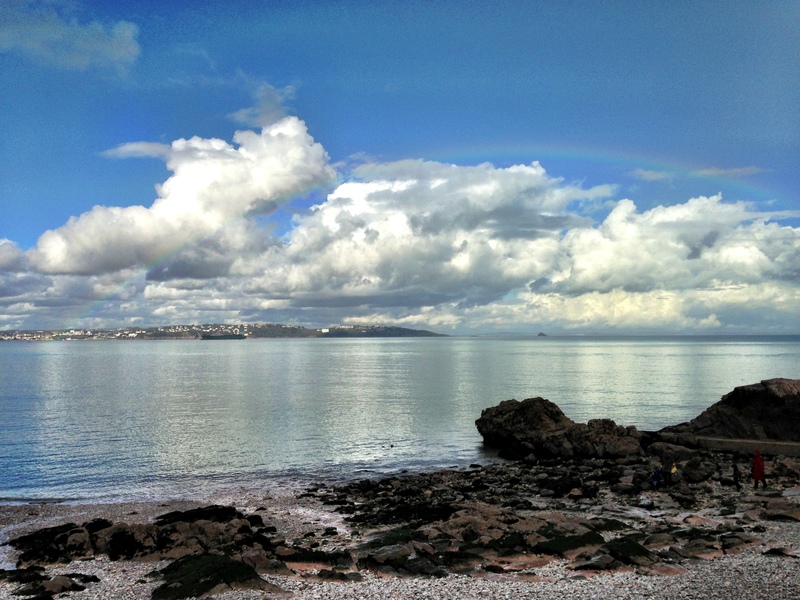 This entry was posted in Sophie is writing, Sophie loves Brixham, Uncategorized and tagged character, character development, motherhood, protagonist, writing on November 27, 2014 by sophieblovett. As I’m muddling though with the research stage of novel number three, and characters and plot begin to swim into focus, it’s becoming increasingly clear that the scenes set forty-odd years ago are going to be both the easiest and the hardest to get right. Easy because the young lovers I am portraying are so vivid in my mind. Every time I stop and think about them more aspects of their personalities and relationship become clear, and I have some very detailed character profiles shaping up. But hard because the world they live in isn’t this one – and isn’t one I’ve ever experienced first hand. I know there’s nothing unique in that: plenty of novelists set their stories in times and places much more distant than 1970s Brixham. And I know I’m not writing a factual piece – I don’t need to get every little detail spot on. But I still want it to be authentic, to have the air of travelling back in time. One discovery I’ve made this week is going to help with that. 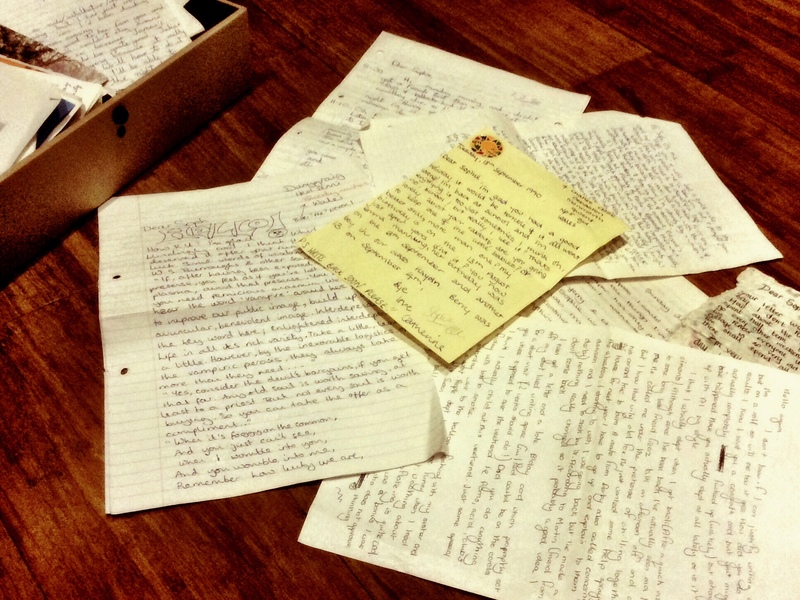 As part of a general organising spree I found a box full of letters from my past – not quite as far back as the period in which the novel is set, I think the earliest ones date from the late 80s. But still reading them through served as a valuable reminder not only of what it really feels like to be a teenager, but also the very different way in which people communicated in a world before the internet. I’m looking forward to creating snippets of my characters’ correspondence, to seeing how their relationship develops when they’re apart as well as when they’re together. I’m also looking forward to finding a bit more out about my town. I’ve been extending my internet research this week, searching for pictures and stories from the Brixham of 1973 to 1982 (or thereabouts). Actually much of what I’ve found so far suggests that an awful lot has actually stayed the same, though I’m sure were I to ask someone who has lived through the changes they would be able to give me a far more accurate impression of the time I’m travelling to. 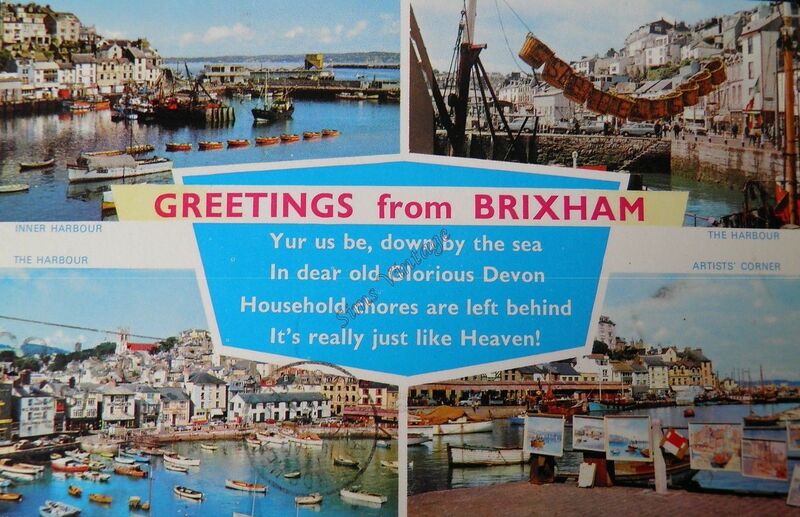 This entry was posted in Sophie is reminiscing, Sophie is writing, Sophie loves Brixham, Uncategorized and tagged 1970s, brixham, Devon, novel, Research, writing on November 25, 2014 by sophieblovett. I had several very late nights last week. Not just because I was on a mission to get myself organised before the craziness of Christmas sets in, but because of what I found in the process. I have always been a bit (a lot) of a hoarder. This is generally something I chastise myself for – resulting as it does in me being surrounded by piles and piles of stuff that I have no idea what to do with. But this week, as I sat on the floor surrounded by these pieces of paper dating back twenty five years and more, I was very glad that I find it so hard to throw anything away. There were letters from friends I have not seen for many years, and from those who I still count amongst my very best. From boys I was once in love with, or who were once in love with me. From my brothers, who it is hard to believe were ever so little, and from older family members who it is hard to believe are not around any more. They were written on pages torn from files, on embossed notecards, on the backs of envelopes, on handmade paper, and collectively they transported me back to a very different time. A time before email. A time before text messages. A time before Facebook. Or WhatsApp. Or Twitter. There are so many ways I keep in touch with people now – and probably if there weren’t I would find it hard to keep in touch with as many people as I do. But there is something incredibly touching about those fading and dog-eared pieces of paper, about the effort of writing out a message by hand, of finding a stamp and an envelope and a postbox. Very few of the letters contained anything of much import. And yet in their banalities and ramblings they said more than a carefully considered few lines on a special occasion ever could. And often, hidden in the clutter of the everyday, there were flashes of the souls of those who wrote, of what I meant to them – and them to me. 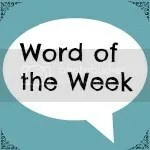 I often look back on my later childhood and teenage years with feelings of sadness and regret. I struggled with depression and anxiety – the degree to which came across starkly in the tortured diaries I also discovered. But my memories of that – blurred themselves by my reluctance to fully transport myself back to the waves of misery I felt at the time – have clearly clouded the reality of the very good times I had in between, and the very, very good friends I had around me. How they put up with me I’ll never know; I fear my demons made me incredibly selfish at times. As well as this quiet self-reflection, this archive from my past got me thinking about something else too. Letters are going to be very important in my third novel. It was a letter from that world, a particularly significant one, which was initially going to form the basis of this post. But that was before I found my stash. And what those letters have reminded me is how different communication was in life before the internet. I’m looking forward to reading and rereading the letters that were sent to me so many years ago as I continue to unpick the lives of my main characters. So much of their friendship – and their love story – will unfold as they put pen to paper. The waiting for their letters to be read and answered, the delicious anticipation when an envelope addressed with familiar handwriting falls through the door, the peeling open of that envelope and becoming immersed in that contents for a few precious moments: all that will need to find its way into my novel. And I think also it needs to find its way back into my life. I have so many friends and family who are not as geographically close as I would like them to be, and whilst the internet has brought with it the wonderful ability to keep up with what they’re doing with their days it will never replace the simplicity or the complexity of a letter. So whilst I’m not normally one for new year’s resolutions, I can feel one simmering here – one that will mean that pile of letters from my past may still have the chance to grow. This entry was posted in Sophie is, Sophie is reminiscing, Sophie is writing, Uncategorized and tagged communication, family, friends, friendship, internet, letter-writing, letters, writing on November 23, 2014 by sophieblovett. This entry was posted in Uncategorized on November 23, 2014 by sophieblovett.